Today was definitely not a day to be swimming, but that did not stop the (fool) hardy Cibbows gang from participating in the Cibbows Second Annual Turkey Dip. This was an important year for the event. The first time could have been considered an anomaly, but two years in a row is the start of a tradition. I have been blessed with friends who are willing to participate in this now annual tradition. This year’s participants consisted of Sondra, Abe, Julia and me. Conspicuously absent were Bess and Mike, but they got a pass since they were at home with their newborn son Cole and the grandparents. I was disappointed not to have them, but I understood considering the circumstances. OK, I'll do it. What time are you picking people up? I fully plan on putting on my wetsuit before I leave my house. Where are you coming from? I am picking up a couple of people by the Williamsburg Bank in Brooklyn at Flatbush and Atlantic Avenue. Don't do something you would regret. While it may be easier to sit on your couch or lie in bed, I am sure years from now you will remember the Second Annual Turkey Dip, but it would be difficult to remember what you saw on TV or thought about while under your covers. Subject: Re: Turkey or chicken? Suffering succotash! Back on the fence. Isn't there an expression "Failure is not an option"? The Turkey is such a majestic bird compared to the Chicken. I've been trying to convince myself that I'm intrepid enough for the Turkey dip, but I've failed. I'll be thinking of you all as you go Cold Turkey. 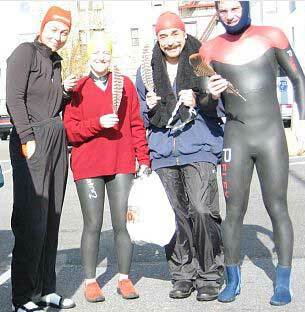 We all drove together to Brighton Beach and began the process of disrobing in the Municipal Parking lot. 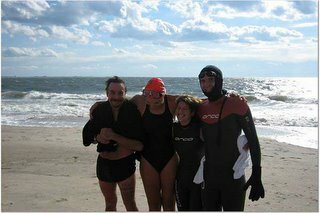 Abe and Sondra stripped down to their bathing suits, Julia put on a long john wetsuit and I completely wussed out and put on a long sleeve wetsuit with neoprene booties, scuba hood and gloves. Sondra provided us all with Turkey feathers and we posed for a moment to snap a picture. On the beach, the wind was blowing so fiercely that the sand was blown as smooth as glass. The sun was struggling to come out behind a fair amount of cloud cover and the water was whipped into a wicked froth. The wind would pick up bits of foam and blow it out over the beach. Depending on your point of view, the sea could have had the appearance of a pissed off body of water looking to kill, or it could have had the look of a wild amusement park ride. We hesitated briefly before entering the water, reconsidering as to whether or not we should be doing this. Really though, the decision was already made, because there was no way we were coming all of this way to turn back. The wind and surf made it hard to enter. The waves were brutally attacking the shore. I caught a nasty wave face first. The sudden rush of cold took my breath away. My head hurt the same way when cold ice cream touches the roof of your mouth. On this day, I really didn’t do much swimming. The neoprene gloves gave me no feel for the water and the scuba hood wasn’t conducive to turning my head to breathe. For the most part, I just hung out in the surf and enjoyed the ride of the swelling waves. Sondra on the other hand, swam at least a few hundred yards and Abe and Julia did a fair amount of swimming as well. As we started to leave the water, one last wave snuck up on Abe. It swept his swim cap and goggles away. Having escaped the water, we came across our friend Tim. He had just finished kayaking and came over to see how we were doing. Tim snapped a couple of more photos and then accompanied us back to the car. After changing, we drove to get some warm beverages and then continued on to our friend Cristian’s house. Just as last year, we crashed on his pad to warm up and chide him for not joining us. Maybe next year he will come. In the meantime, I am grateful for a very successful past year and my good friends.